We made two batches and set them aside in a quiet area of the shop. The main gist of my post, though, follows. The workshop facilitators had already started one batch of beer in order to show us how to siphon from one carboy to another for secondary fermentation. 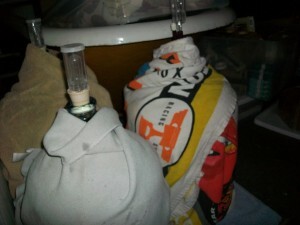 And there, in the bottom of the first carboy, was … BARM! I asked and so rescued it from being tossed and proudly took it home in a jar. I immediately took two cups of the barm, placed it in a glass bowl, and added a teaspoon of sugar and a cup or so of flour (however much was required for a sponge). I stirred vigorously, then covered it with a clean towel and set it in the (unlit, unpilot-lighted) oven out of drafts. That was Saturday night. Sunday morning I checked on it, and it was still like tired sourdough. I stirred it and added another little bit of water and flour, covered it and set it aside. On Monday morning I checked it, added flour and water and stirred it, then covered and set aside. It’s getting more active. Tuesday I added another teaspoon of sugar along with a bit of flour and water, stirred it and set aside. This morning (Wednesday) it was bubbly. So I added a bit of water and flour and stirred it and set aside. It’s beginning to smell less like beer and more like bread! The following day, it was bubbly and so I added flour to make it into a dough. I let it rise, but it was dense. Baked it on a stone at 450 degrees for about 45 minutes. 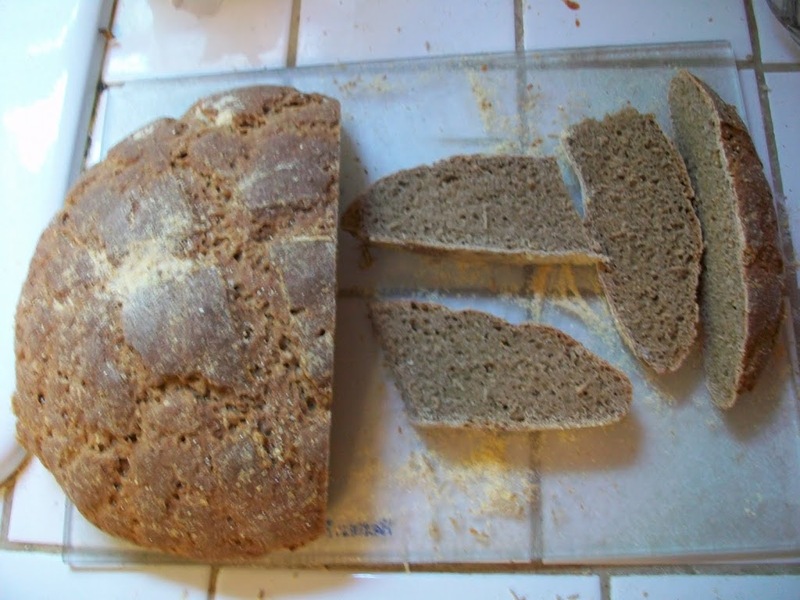 I call it my “Monastic Bread,” because it was very dense and tasted strongly of beer, with a hops aftertaste. I’ll make another try with a different method next time.